Nobel Laureate Kailash Satyarthi will speak Friday, April 26, at 10 a.m. in the Schaefer Center for the Performing Arts on Appalachian State University’s campus. His talk, titled Making Positive Changes in the World, is a co-presentation of the Walker College of Business’ Boyles Distinguished Lecture Series and the Global Opportunities Conference, sponsored by the Anne Cannon Trust. The lecture will offer an unprecedented transformational opportunity to the community, especially students of all backgrounds, who are encouraged to come learn from a Nobel Laureate about innovative ways to address complex ethical issues and how to make a positive impact, both locally and globally. Mr. Satharthi is a globally renowned advocate for children’s rights, a master strategist against child labor and suppression of young people, and a tireless campaigner to end the global education crisis. For his extraordinary commitment to these causes, Mr. Satyarthi was awarded the Nobel Peace Prize in 2014. A native of India, Mr. Satyarthi has been at the forefront of driving child-related agendas into the United Nation’s Sustainable Development Goals. As a global campaigner for children’s rights, Mr. Satyarthi founded the Global March Against Child Labour, the largest civil society network for the most exploited children. The march, conducted in 1998, traversed 80,000 kms across 103 countries, galvanized support which culminated in the unanimous adoption of the ILO Convention 182 on the Worst Forms of Child Labour. He is also the founding president of the Global Campaign for Education, an exemplar civil society movement working to end the global education crisis, and GoodWeave International, which raises consumer awareness and positive action in the carpet industry. To fulfill his vision of a world free of violence against children where all children are free, safe, healthy, educated, and have the opportunity to realize their potential, Mr. Satyarthi established the Kailash Satyarthi Children’s Foundation. The Foundation’s mission is to advocate for the creation and implementation of child-friendly policies through research, advocacy and campaigning to ensure the holistic development and empowerment of children. Currently, Mr Satyarthi is spearheading the 100 Million campaign which aims to inspire and mobilize young people to stand up and act for their own rights and the rights of their peers, and to achieve the world’s biggest youth mobilization to end violence against children, eradicate child labour and ensure education. The lecture will serve as the 61st event in Appalachian’s Boyles Distinguished Lecture Series and the 11th annual Global Opportunities Conference. A reception will follow the lecture. Both events are open to the public with no fee to attend. A free screening of “The Price of Free” will take place Wednesday, April 24, at 5 p.m. in I.G. Greer Theater. “The Price of Free” tells the story of human rights activist Kailash Satyarthi, whose efforts have rescued 80,000 child factory workers in India. 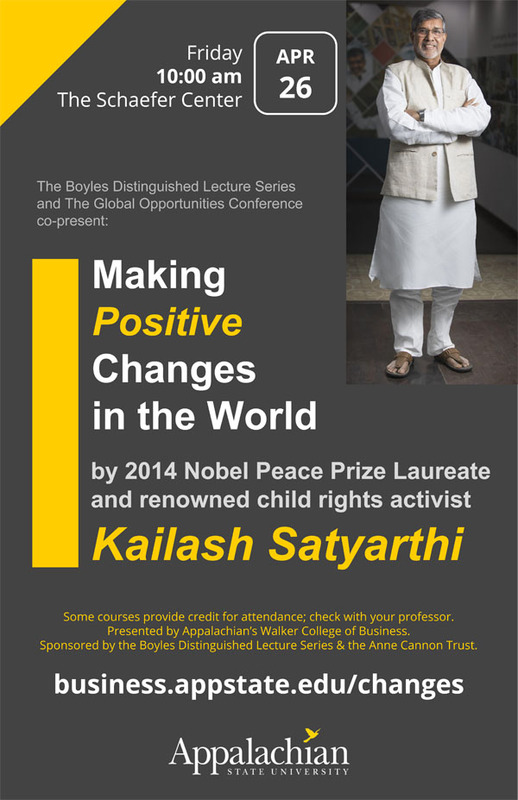 Visit https://business.appstate.edu/about/news-events/events/kailash-satyarthi-talk to watch the trailer for this event and to learn more.